I have been going through another bout of Kate & Curran withdrawals lately. Really, they're simply Ilona Andrews withdrawals because I just am ten different ways in love with the way they write a world. I know going in to expect to be amazed, delighted, and--above all and thank the high heavens--entertained. Whether its shapeshifters and magic waves, overlapping dimensions and backwoods feuds, or futuristic assassins and genetically enhanced mafiosi--it is guaranteed to get my bibliophilic heart pumping and I can't tell you how much I look forward to each encounter. This is a good year because we get two full-length novels in two excellent worlds and, having already downed Magic Bleeds , I found myself looking ahead longingly to September and the release of Bayou Moon . And then it occurred to me that I'd never gotten around to reading Silent Blade , the novella published last year from Samhain. I'm not sure how it slipped past me, but I immediately purchased it, downloaded it to my nook, and dropped offline for the evening. Meli Galdes is ready for retirement. Having served her family for more than a decade as a lone assassin, she's planning on hanging up her spurs and falling off the grid completely. Then her father calls in one more favor and it involves a man Meli thought she'd never see again. Celino Carvanna is responsible for the life of danger and isolation Meli leads. Years ago their lives were intertwined and then, in the space of a heartbeat, the connection was severed and Celino went on to monumental success and power, while Meli walked away from everything and everyone she ever knew, shaping herself into an elite (and secret) weapon. Now, on the cusp of retirement, she's asked to take on this one last job. For her family. One last hit to round out her career on a high and oh-so-satisfying note. Then she'll be able to put it all behind her and see about creating another kind of life for herself. But it's been a long time since she knew what made this ruthless businessman tick, an even longer time since she cared. Neither of them are who they once were. And so she sets about remembering every detail, pulling up every familiar quirk and distant memory, so that when she finally comes face to face with Celino once more, she will be ready. She won't hesitate. She'll know just what to do. And, as is the case with all her targets, he won't even know what hit him. I don't think I realized going in that this novella was science fiction. What a pleasant surprise that was! Set in a futuristic society, in which a cadre of powerful families--known as the Kinsmen--rule a world built upon the basis of their particular biological enhancements, Silent Blade pelts out of the starting gate with gusto. Meli is established right of the bat as a woman who has honed her skills and is the best at what she does. She flies solo and completely under the radar and I loved her from page one. As her history becomes clearer, I found myself utterly on her side and very much in favor of her meting out whatever punishment necessary on the heartless Celino. What can I say? I'm always up for a vengeance quest, especially when the person on the hunt is so justified and awesome and, well, adept when it comes to the actual punishing. Then the point of view switched, and I was forced to walk a few paces in Celino's shoes. And while I was still on Meli's side, I admit it--I was curious. Curious to see how he'd react when all was revealed. Curious to see if Meli's resolve went the distance. I loved the wild swirl of color and scent and taste running through this world. Meli loves each of these things and, while she's voluntarily put them aside in the service of her family, there are hints of them here and there, even in the ascetic existence she embodies. This is romantic science fiction a la Linnea Sinclair and Ann Aguirre and, though it is a shorter work and wraps up nicely, I would happily read much larger and longer doses were they available. Meli is very much her own woman and I really think there's plenty of fodder here for many more stories. Perhaps one day we'll get them. 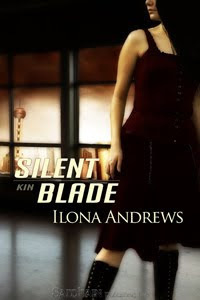 In the meantime, if you're an Andrews fan, I highly recommend Silent Blade . You won't be disappointed. Glad you liked this one. I thought that the families in this world were very interesting, and I liked how family = corporations/the mob. I should've reviewed this one ages ago. Thanks for reminding me. Oooh, you have a nook! How are you finding it? I'm very tempted by the new Kindle myself. Back on topic, I read once on their blog (I think), that with Silent Blade, they were going with a Harlequin type of writing style, whereas with The Edge books, those were more in the historical romance style (paraphrasing horribly here), which I found rather interesting. I think they also said sales for this novella were tiny compared to their mass market releases (probably - obviously? - due to the publisher, so I'll be curious to see if they do a sequel. I would love one though. I didn't even know they had a novella! I don't have an e-reader but I will probably buy this and read it on the computer. Just like you, I'm experiencing withdrawal symptoms from Kate and Curran. I feel like I'm living off the snippets that they post on their blog. I should read this and On the Edge soon just to get a taste of the incredible writing of Ilona Andrews. By the way, how is the Nook? I'm tempted to get the cheaper version of the Kindle once it comes out. I hope it's available internationally though. Why have I never heard of this? Must get it soon. I'm glad September is so close, though. I'm really looking forward to more of The Edge. You know, with all of these nook related comments, you may find yourself having to write an entry on the nook itself . . .
Jen, ooh, I'm glad. I'd love to talk with more people who've read it. Liv, my pleasure. What did you think of it? Li, so here's the thing. My dad is a big gadget man. He cannot resist the toys. And so he ordered a nook right when they came out, but he lives overseas and it didn't work. He couldn't download books there, etc. So he sent it to me a couple months ago and I've had it sitting on my desk looking pretty, but never really given it a go. I decided to jump in with SILENT BLADE and see how things went. I like it so far! Must read something longer on it to see how I fare long term. Chachic, ooh, you gotta read ON THE EDGE before BAYOU MOON comes out. I'm so excited for that. And I like the nook. It was a gift or I wouldn't have one. Like I said, I need to read a full-length novel on it to see how I enjoy that. It's hard for me to substitute clicks for the turning of pages. I struggle losing the tactile experience. Holly, you must. It's a lovely interlude in between Kate and Edge worlds.